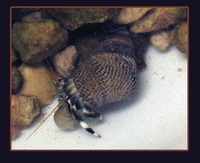 Will not bother fish tankmates, but may prey on snails for their shells. Will eat many kinds of algae, including red slime algae. If there's not enough algae present, supplement with dried seaweed. A small hermit. The lower half of its eye stalk is blue, and the upper half, orange. The legs are striking with black and white banding. This page was last edited on 22 August 2018, at 17:13.